There are a few jazz shows at Bumbershoot … all of which seem to be on Saturday. 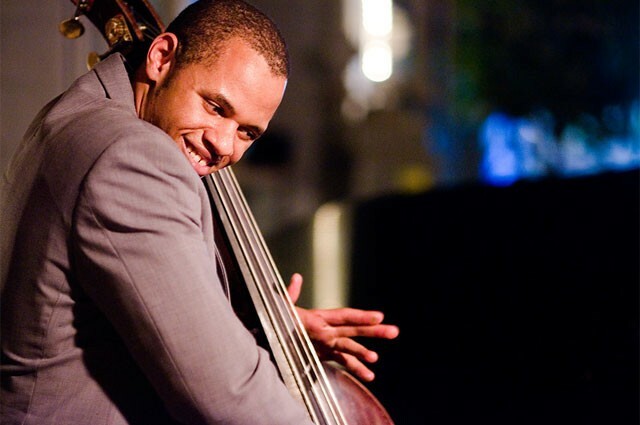 11:45am – Evan Flory-Barnes and Infinity Upright! The Ship Canal Grill was packed last night as Jay Thomas’ Wednesday Night Jam Session came to an end. The session had been popular with many local musicians as well as many of the high school students in the area. Thomas made an announcement at the end of the night that he is looking for a new location for the jazz session. There are a bunch of new music-related movies coming out soon. Here is a trailer for Keep On Keepin’ On featuring the legendary Clark Terry. TERRY GROSS, HOST: This is FRESH AIR. 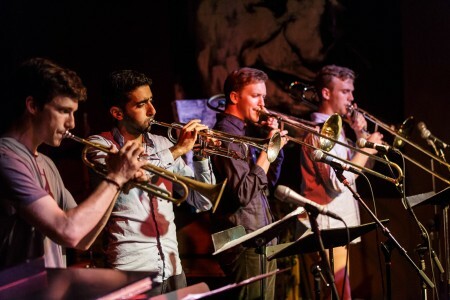 The Westerlies is a quartet of young New York brass players, who know each other from school days in Seattle. 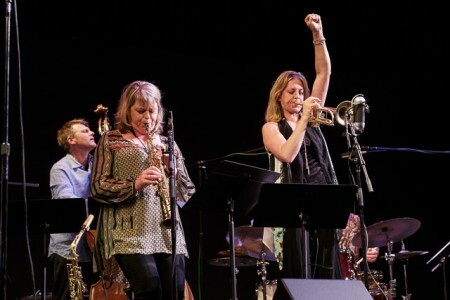 Their debut album is a set of pieces by Seattle-based composer and improviser Wayne Horvitz. Jazz critic Kevin Whitehead says Horvitz and The Westerlies are a perfect fit. KEVIN WHITEHEAD, BYLINE: Since Wayne Horvitz left New York for Seattle in 1989, he’s burrowed deep into the city’s musical life. He composes for the theater, for classical ensembles and his own improvising bands, and he runs his own club. He’s taught and mentored and hired lots of younger musicians, including the future members of the two trumpet, two trombone quartet The Westerlies. During that band’s second year together, Horvitz asked if they might be interested in recording some of his music, though none of it was written for brass. They were interested. WHITEHEAD: Trumpeter Riley Mulherkar on “Home” from The Westerlies’ album “Wish The Children Would Come On Home: The Music Of Wayne Horvitz.” His pieces may carry a strong whiff of folksy Americana, sometimes in a subdued minor key. Some short tunes are built on just a shapely phrase or two. Horvitz calls them miniatures with places for improvisations. WHITEHEAD: The Westerlies play this music clean as a whistle, with attention to detail born of long rehearsals. And they infuse the lyrical passages with deep feeling. 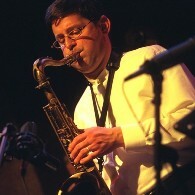 Wayne Horvitz’s “The Band With Muddy” was written for strings and woodwinds. But it has more punch transferred to brass. WHITEHEAD: Back in the 1980s, Wayne Horvitz had a rare knack for making digital synthesizer sound warm and human. The Westerlies had the good sense to have him sit in on one of those miniatures “I Wish The Children Would Come On Home.” Horvitz’s synthesizer wails like a spaghetti Western harmonica on an older version. WHITEHEAD: Wayne Horvitz also plays synthesizer on three brief interludes. You might almost wish the composer had joined in more often, but The Westerlies can sound like they’re using electronics even though they don’t. WHITEHEAD: There are a few such echoes here of riffing minimalism, another music built on the cumulative power of simple riffs. It’s part of the mix alongside jazz, chamber music, small-town brass bands and garage rock. The Westerlies represent a breed of musicians rare when Wayne Horvitz was coming up, skilled interpreters who are also adept improvisers. With such versatile and well-equipped performers around, composers can expand their reach and they may all wind up in places they might not have found on their own. GROSS: Kevin Whitehead writes for Point of Departure and Wondering Sound and is the author of “Why Jazz?” He reviewed The Westerlies’ “Wish The children Would Come On Home: The Music Of Wayne Horvitz,” on the Songlines label. Sisters Ingrid and Christine Jensen were reunited in concert at Centrum’s Jazz port Townsend in July. Their concert at McCurdy Pavilion was recorded for Jazz Northwest and will be broadcast on Sunday, August 17 at 2 PM Pacific on 88.5, KPLU. The sisters grew up in Nanaimo, BC and have gone on to successful musical careers. Christine Jensen now lives in Montreal where she composes for and leads her own jazz orchestra. Ingrid is based in New York and leads her own groups and plays with the Maria Schneider Orchestra and other ensembles. Both have recorded numerous CDs and tour internationally. Backing The Jensens in this concert are three stars in their own right… Pianist Geoffrey Keezer, bassist Martin Wind and drummer Jon Wikan. The concert features mostly original compositions by Ingrid and Christine Jensen. Jazz Northwest is recorded and produced by Jim Wilke, exclusively for 88.5 KPLU and airs Sundays at 2 PM Pacific and streams at kplu.org. The program is also available as a streaming podcast after the broadcast. via Earshot Jazz: Tenor saxophonist Anton Schwartz performs with Julian Priester in Schwartz’s popular loft concert series, August 16, 8pm. Reservations are required. To reserve seats, by requested donation, visit loftconcert.com. Requested donation is $25-$40. With Priester and Schwartz: Dawn Clement (piano), Geoff Harper (bass), Byron Vannoy (drums). Priester has been a part of countless history-making bands over the past 60 years, performing and recording extensively with the likes of Duke Ellington, Max Roach, Lionel Hampton, Sun Ra, Dinah Washington, John Coltrane, Philly Joe Jones, Ray Charles, Herbie Hancock, Abbey Lincoln, Freddie Hubbard, Art Blakey, Blue Mitchell and Woody Shaw. This concert features the members of Priester’s quartet Priester’s Cue, expanded to form a quintet with Schwartz on tenor sax. They will perform a program of compositions by Priester and arrangements of jazz standards. More at http://loftconcert.com/2014/julian-priester. Arun Luthra at Egan’s tonight! New York saxophonist Arun Luthra is in town this week and will be performing Thursday night at Egan’s Ballard Jam House (9:00pm). 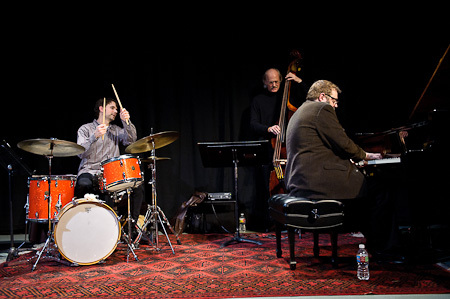 The band includes John Hansen (piano), Jon Hamar (bass) and Matt Jorgensen (drums). 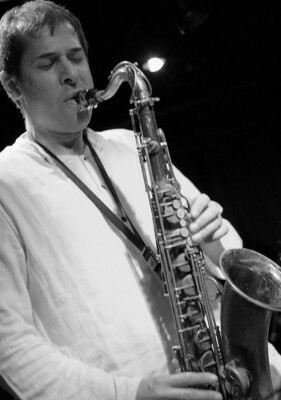 Arun Luthra has been one of the premiere saxophonists and composers on New York’s jazz scene for well over a decade. He is one of the small group of American jazz musicians of Indian heritage who have continued to explore to possibilities of fusing the modern post-bop sound with elements of Indian classical music, as well drawing from a wide variety of modern & classic musical influences to create a vibrant new sound & style. Pianist Dave Peck will celebrate his birthday with a weekend at Tula’s, August 22-23, and this year it will feature free cupcakes! Joining Peck will be Jeff Johnson (bass) and Byron Vannoy (drums). The Steve Griggs Ensemble will perform 10 free events at branches of the Seattle Public Library beginning on Sunday, August 3. This residency is supported by the library and Chamber Music America Residency Partnership Program. Titled Songs of Unsung Seattle, the original narration and music programs will include Panama Hotel Jazz about Japanese American endurance of injustice during WWII and Cup of Joe Brazil about jazz saxophonist Joe Brazil’s community development through music in the face of civil rights injustice during the 1960’s and 1970’s. The residency will explore connections between Seattle history, original music, and the library’s collection. Go to www.spl.org/jazz for complete schedule information. The ensemble includes saxophonist Griggs, trumpeter Jay Thomas, vibraphonist Susan Pascal, guitarist Milo Petersen, and bassist Phil Sparks. 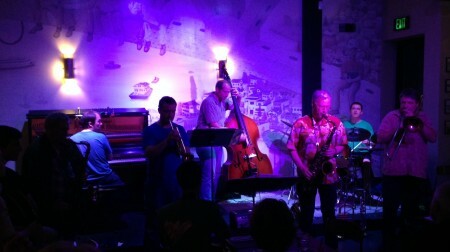 Panama Hotel Jazz was created through a 4Culture Historic Site Specific Grant and won an Adventurous Programming Award from ASCAP and Chamber Music America. Cup of Joe Brazil is based on biographical research into Brazil’s life supported by a 4Culture Individual Artist Project and the Jack Straw Foundation Artist Support Program.